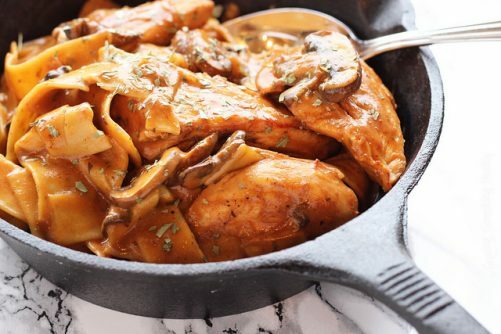 This easy, one-pan chicken dish is the ultimate in rich and creamy comfort food. No one will guess it’s lightened up and good-for-you! Hey there El Nino. Go. Home. Please! It’s cold, and raw, and nasty in my part of the world right now, and it’s all thanks to a little guy named El Nino. I used to love it when he came ’round to visit me in New England, because it meant wet and rainy, and I would take that any day over snow and sub-zero temps. But now, I live in Arizona. AKA The Desert. Where it’s been pouring rain and freezing cold for what seems like weeks. Thank God for comfort food. 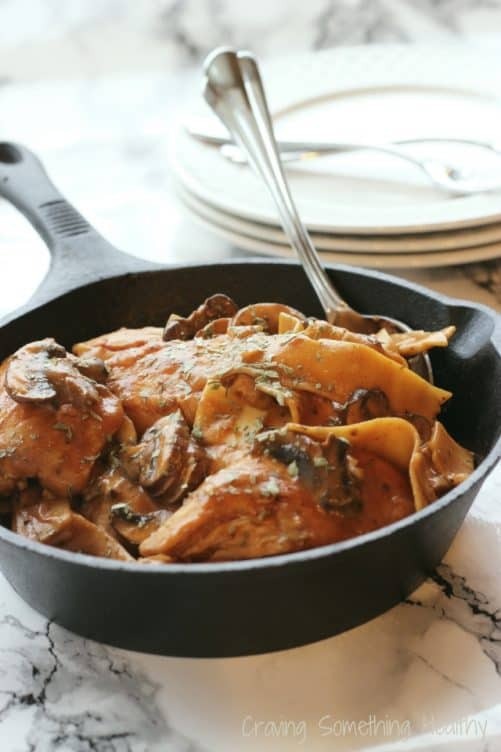 Especially a delicious one-skillet recipe. Although I eat mostly a plant-based diet, I often say that I could never really be totally vegetarian because of one major food that I can’t live without- chicken stock. It’s always been my secret ingredient to boost the flavor in everything from stir-fries, to stews and chilis. Good chicken stock is hard to find. You see, chicken “stock”, is different from chicken “broth”, because stock is made with bones. You might think that’s a new trendy, paleo thing, but in reality, it’s more of a quality and taste thing. Real chicken stock has been around since the start of good cooks, and it’s what gives soups and stock-based sauces a deep, delicious flavor without adding lots of extra fat or salt. I’m totally thrilled that Progresso has come out with a new line of cooking stocks that are full of rich, meaty flavor, but low in calories, fat and sodium. All are slow-simmered with real bones, vegetables and herbs, to taste (and even look) like homemade stock. I used the Unsalted Chicken Cooking Stock to make this silky, luscious and very flavorful sauce. It’s my little secret that will take your cooking to the next level and make everyone come back for more. You’re welcome. Pat the chicken breast pieces dry, and sprinkle them with salt and pepper. Heat the oil and butter in a large sauté pan over medium high heat. Remove the chicken from the pan, and place on a plate, and set aside. Add the onions, mushrooms and garlic to the saute pan, and let cook for about 2 more minutes until softened. Add the flour, and stir for about 30 seconds. Add the tomato paste, and stir again to combine. Slowly pour in the Progresso Cooking Stock, salt, and tarragon, and stir well. Bring the stock to a boil, and then add the dried pasta. Mix to submerge the pasta, and lay the chicken breasts on top of the pasta. 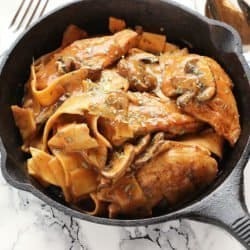 Reduce the heat to low, cover, and let simmer for about 8-10 minutes or until the chicken is cooked through, and the pasta is al dente. Place the Greek yogurt in a bowl or measuring cup, temper the yogurt by slowly adding a soup ladle full of the pan sauce to the yogurt, while stirring to combine. Add the warmed yogurt into the sauce, and stir well to combine the chicken and noodles with the sauce. Eat well, and don’t forget to visit the other recipes below that all feature Progresso Cooking Stocks. Looks like such a comforting dish for the winter! Totally my favorite pasta noodles too Emily! So chewy and hearty! Thanks so much Pat! Happy New Year to you! Yum, I love tarragon and just ate a chicken salad with avocado and tarragon. Will try this recipe soon! Thanks for visiting Janice! I’m a huge fan of tarragon too – it’s such an underused herb. Hope you enjoy the recipe! I totally agree about quick and easy 🙂 Thanks for stopping by Allie! 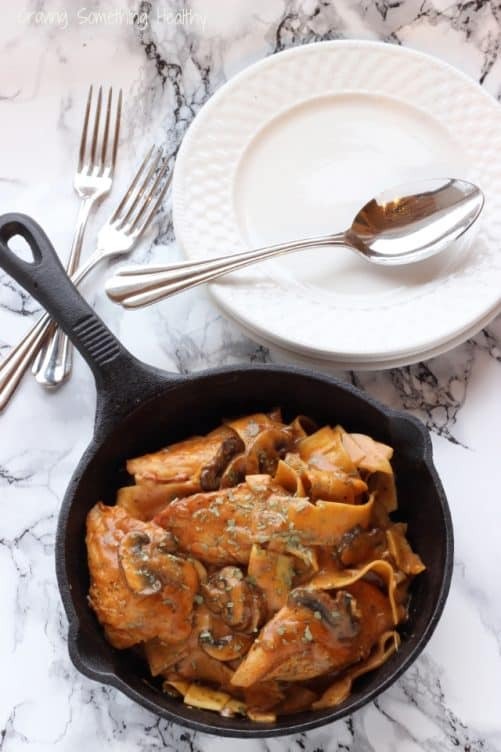 Love how you used parpardelle in this dish – comfort food at its best! This looks so flavorful – I can taste the umami from the broth and tomato through the screen! Love pappardelle noodles too. Love love this one pot meal! I know my husband is going to love this so I’m def adding this to my next week’s meal plan!! Thanks, Anne! Gorgeous comfort food? That’s hard to do. But these pics are so bright and beautiful! Awww thanks! I was worried because I’ve had some very bad experiences with photos of comfort food! The sun finally came out in AZ!